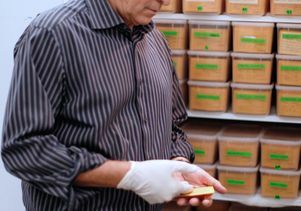 UCLA professor Thomas Smith holds two of the 180,000 feathers in the UCLA feather bank. These feathers will assist the Bird Genoscape Project in identifying the population-specific migration paths of many different species. The Bird Genoscape Project will be discussed by a panel of leading UCLA scientists, solar industry representatives, conservation agency personnel and conservation organizations at an event held today in conjunction with the Solar Power International conference. Researchers at UCLA’s Center for Tropical Research have already mapped the migration paths of sub-populations of the Wilson’s warbler, and compiled the genomic data of a second bird species by analyzing DNA taken from the university’s extensive feather collection, which contains genetic material for hundreds of species. The work builds on more than 25 years of research on migratory birds by the CTR and its director, Thomas Smith, a professor of ecology and evolutionary biology in the UCLA College and a member of the university’s Institute of the Environment and Sustainability. First Solar, a leading U.S. manufacturer of photovoltaic modules, donated $600,000 to provide seed funding for the Bird Genoscape Project that will allow researchers to focus on six species during the next three years. 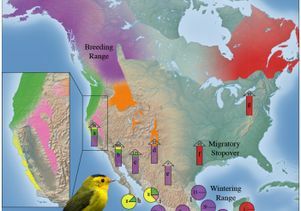 Along with a $350,000 anonymous donation to UCLA’s ecology and evolutionary biology department for genetics equipment, First Solar’s gift will enable the researchers to identify genetically distinct sub-populations, and precisely map the various breeding and wintering locations of two water bird species and two song bird species. 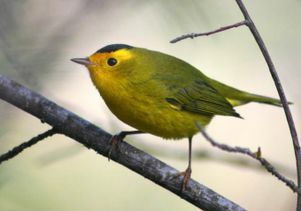 The project will also assess potential threats to the researchers’ two previously mapped birds, the Wilson’s warbler (map below) and Swainson’s thrush. The researchers aim to attract additional funding to expand the Bird Genoscape Project to include 50–100 species in the future. UCLA evolutionary biologist Kristen Ruegg, an adjunct assistant professor and senior researcher at the Center for Tropical Research who will co-lead the mapping project, collaborated with Smith on the original research to develop the new gene-analysis method, and was the lead author on the recent study mapping the migration paths of the Wilson’s warbler and that species’ sub-groups. 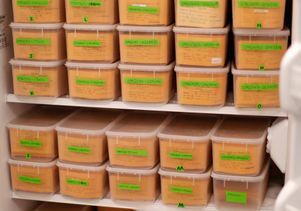 UCLA is a leader in the field of conservation genomics, and the campus maintains the world’s largest scientific collection of individual bird feathers — part of the Donald R. Dickey Bird and Mammal Collection at UCLA, with 180,000 feathers collected starting in the mid-1980s. Using those feathers, Ruegg and Smith will create genoscapes that map the genetically distinct populations of the birds across their breeding range. 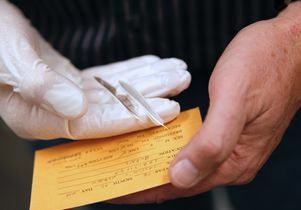 In the proof-of-concept study of the Wilson’s warbler, the researchers applied new DNA analysis methods that are powerful enough to obtain results from the small amount of DNA on the tip of a feather. 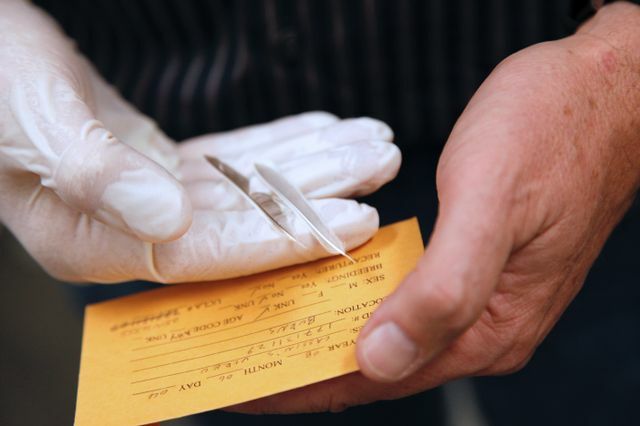 The researchers used the feather DNA to study a large fraction of the birds’ genome and uncover genetic markers that distinguish sub-populations. They then used new high-speed genetic testing to make connections between wintering and breeding populations. A 2014 study conducted by the Audubon Society concluded that more than half of North America’s bird species will be climate-threatened or climate-endangered by the end of the century. 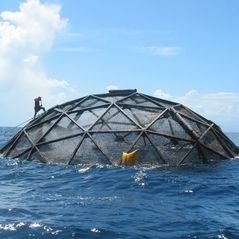 “Our mission is to conserve and restore natural ecosystems, focusing on birds, other wildlife, and their habitats for the benefit of humanity and the earth’s biodiversity. This cutting edge-research adds a critical piece to what we know about populations of birds to inform our conservation advocacy and implementation,” said Garry George, renewable energy director for Audubon California. While the Bird Genoscape Project focuses on avian species, the new method of analyzing genes and genomes could change the entire field of conservation management by making it easier to rapidly identify unique sub-populations within a species and quickly reveal whether those sub-groups require conservation, the researchers said. The Institute for Bird Populations, a California-based non-profit that coordinates bird monitoring efforts at hundreds of bird banding stations across North America and Central America, will contribute to the project by coordinating the collection of feathers from target species, and by providing information on the demographic rates of the specific populations of birds that are identified and mapped by the genetic work. “We look forward to participating in this collaborative effort to better understand the demographic and environmental causes of population changes in migratory birds and to developing habitat management strategies to strengthen bird species’ resilience to climate change,” said Rodney Siegel, executive director of The Institute for Bird Populations. 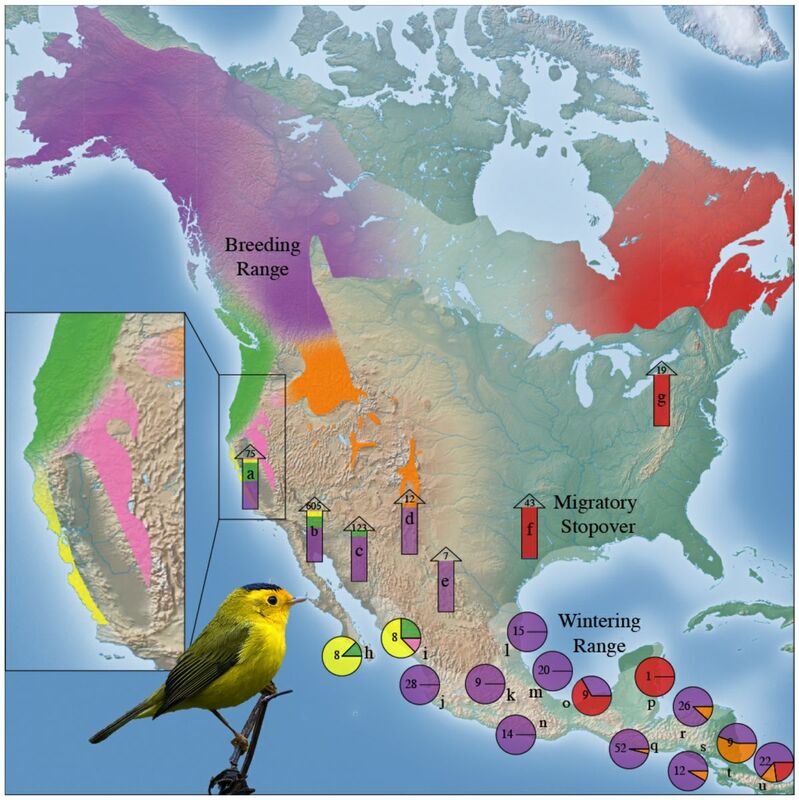 UCLA researchers identified genetically different sub-groups of the Wilson’s warbler (illustrated by different colors) and determined where each sub-group breeds, migrates and winters.